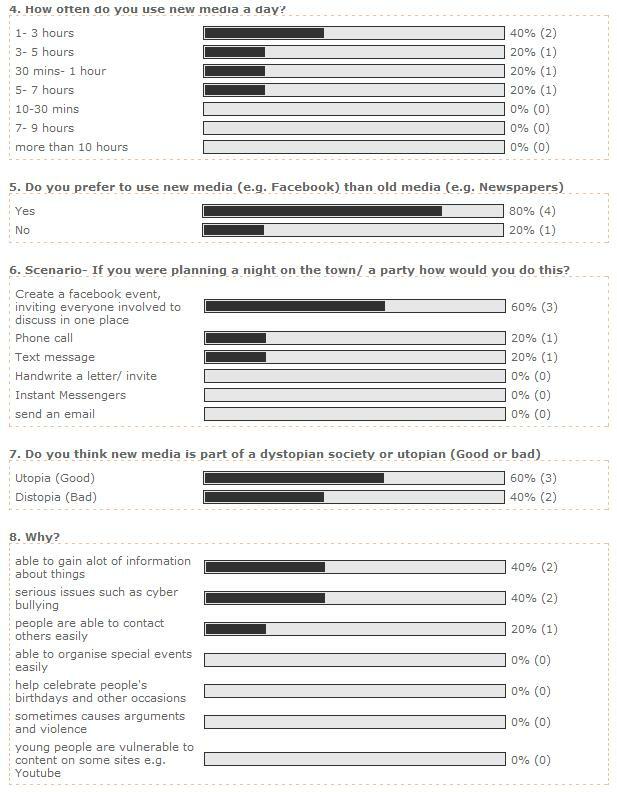 As part of my Media homework I was asked to create a questionnaire using Poll Junkie investigating how people use new media such as Facebook and the i Phone technology. I have posted it on my Facebook profile and asked many of my friends and family to respond to it so I can get a variety of ideas and views on the types they use and how long for. So far I have had 5 people complete the poll, as the week goes on I should have plenty more to look at and analyse. In order to help me decide what things I will need to include into my final G324 pieces, I have created a questionnaire using Poll junkie which I have distributed to other Media students and published on social networking sites such as Facebook to get results and so I can get enough information from a range of different audiences. I have set the expiry date in 2 weeks where it will become inactive and finish on 2nd October. 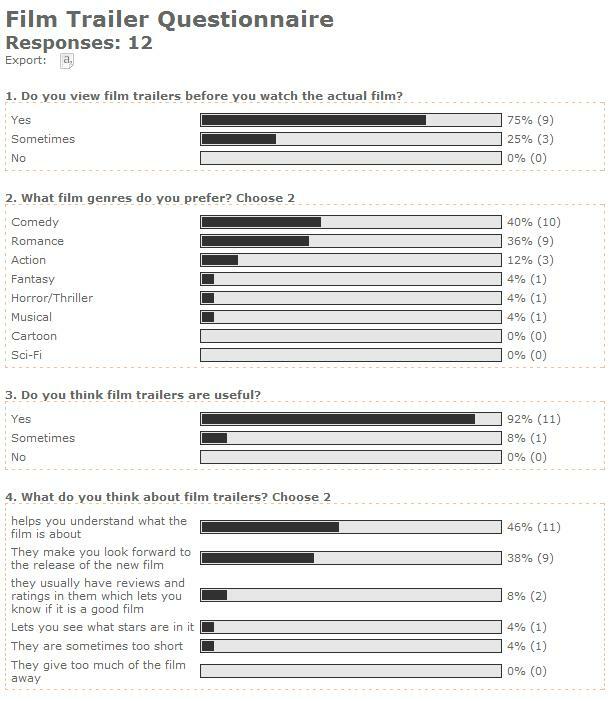 Here are the responses so far ,hopefully this will give me a better and bigger response so I can see what people would like in my film trailer and what they overall think of them so I can create a product that fits to their requirements. At the end of my investigation I finally received a total of 12 responses. 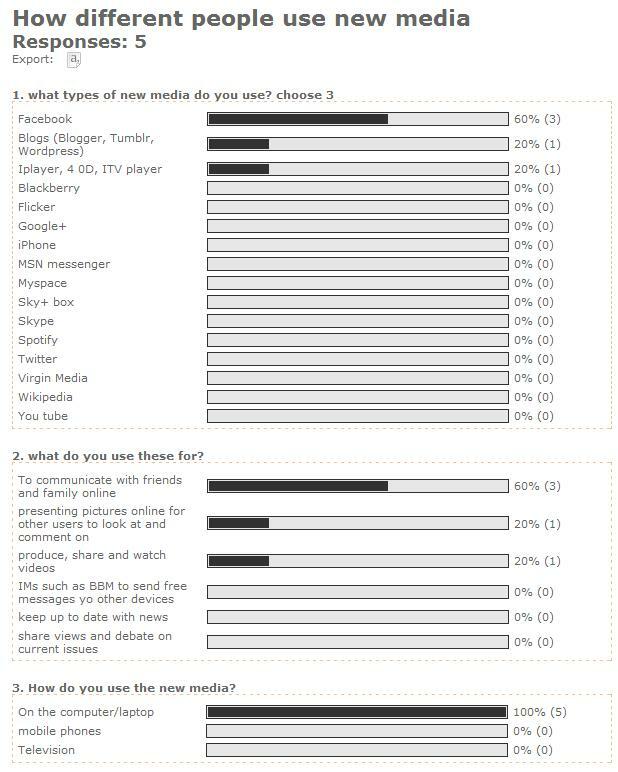 I was quite surprised at the range of different things people are most interested in and how often they used film trailers and what they thought of them. As much as I like the Comedy and Romantic genres I felt that it would be quite difficult to create something to that specification in terms of the trailer, as you don’t really see many products around that show romantic themes. However I have seen quite a few comedy but yet again felt that it would be particularly hard to portray due to the different senses of humor people have therefore they could find things more amusing than others. Due to the releasing of Twilight and Harry Potter there has been a massive fan base with the films so I thought that as it was so popular I could definitely produce my coursework on the Fantasy Genre.